213.6 (down from 214.2) - not that big a loss. But, over period week, I'm not too upset over that. At least it's some kind of loss. And considering I only worked out twice last week... that's not bad. 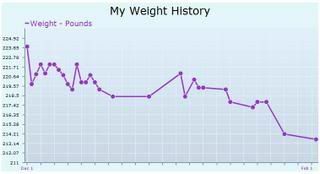 Here's my weight chart from December 1st. This means I've lost just over 10 lbs in two months. Really, that's under what I want to be accomplishing. Particularly with my eating, I should be losing more. I need to work out more!! I tend to do the gym twice and then Wii every other day. Wii is good but I'm not paying $80/month for the frickin Wii. Have I mentioned how cold it is here? It's hard to leave a nice, comfy, warm house when it's freezing out to go work out. I'm gonna go today, dammit. UGH! Hey...those charts are pretty cool. I've never seen them! I have to look them up. It does seem like you need a boost in your activity level. That always seems to do the trick when you hit a plateau. I think your expectations may be a little high. As long as you're losing steadily, you're doing fine. My goals are always doing the right thing, i.e. 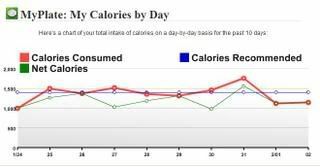 eating correctly and exercising. You're setting yourself up for disappointment and possible failure when you make a result the goal. Well done on your loss this week! I am with hanlie there. Don't worry about meeting loss goals, as long as you are indeed losing. Remember, you are probably developing muscle from the increase in activity, which is bound to slow your initial weight loss. I can tell you from experience: the fat boys in basic training didn't start losing poundage until later in the second half of training, at first they were just losing size. Have you taped yourself?